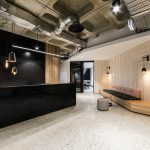 IA Design in partnership with FDC Construction and Fit out recently completed a revitalisation project of a global pharmaceutical company’s workplace. The key to the project’s success was the collaborative approach from the designer, builder and client. It ensured the final product was both functional and aesthetically rejuvenated. Our client’s recent shift away from individual offices to open plan, meant that the existing offices across three levels were under-utilised. The aim was to convert those rooms into useable meeting and team spaces that could be booked on the spot. The room formulas included huddle rooms that are for quick scrum meetings and enclaves consisting of two forms, one being a lounge respite and the other a focus point. In addition to these smaller spaces, larger project rooms and brainstorming rooms were created for teams. The project included a large and specialised graphic component. FDC and IA Design worked alongside Digital Artworks to create unique and inspiring glazing and wall graphics that would invigorate the employees’ experience. The concept of these graphics referenced the elements in the periodic table which correlates with the client’s core business of medical research and treating serious disease. The three levels allowed us to use solids, liquids and gases as a theme for each floor. We then developed design concepts for the elements across individual rooms. 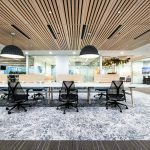 The success of the design and project delivery was a direct result of a collective and cohesive creative approach by everyone involved. This collaboration not only allowed for a strong and rewarding outcome but made the process fun and exciting for all involved.